How can it be May 30th? That would mean that a whole week has passed since my son and his bride tied the knot! It seems like yesterday—no, wait—it seems like a year ago. How can I be so confused? Yes, after five and a half years of courtship, my son and the Daffodil (remember? –De Facto Daughter-in-Law) finally made it legal. One week ago these lovely and kind and warm and smart and funny young people stood before their families and friends and recited vows and prayers that make them husband and wife. 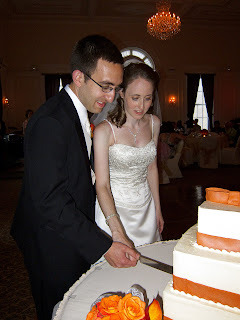 They signed the documents, they ate the cake, and they danced the official dance. 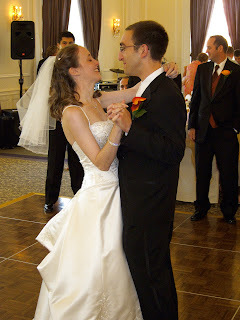 I cried during the ceremony, but I got control of myself, too. It’s hard to be at a lifecycle event as important as this and not look back at the milestones in your child’s life. From the first time you held him, to his first steps, his first words, and for us, the first time he beat me at Scrabble. I was asked just this morning if I was having a hard time with this—you know, letting go of my son. The answer was easy. No. I want my kids to be healthy and happy, to be strong and independent and generous. I want them to make good choices. Look at them—I got what I wanted. They’re both making wonderful choices again today. Rob and Jessica, may your happiness continue to grow throughout long and meaningful years ahead, and may all your dreams come true. It was a warm and poignant event, capped off with lots of great music and dancing. 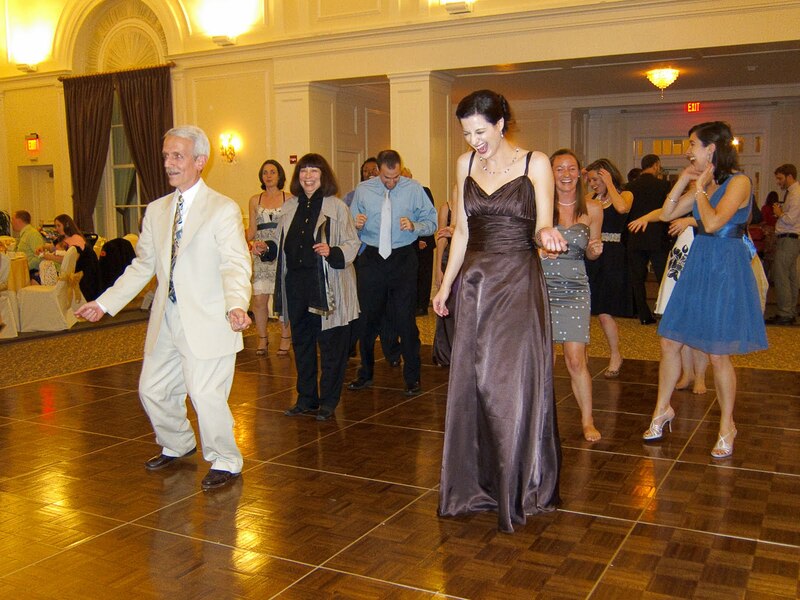 They had a great time, and so did everyone else in the place. I’m not having a problem being a mother-in-law. I’m having trouble getting used to Rob calling Jessica his ex-girlfriend. And since you were kind enough to ask, here are a few photos of the happy event! See? I told you they were cute! Happy is good. Happy with cake is better. Wedding Day Is Here at Last! 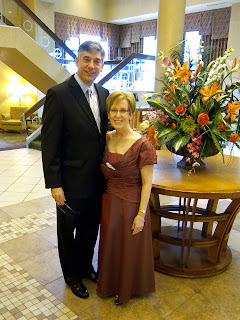 Just a joyful note to let you know that I am pre-posting this, because my son is getting married today! We have travelled to Pittsburgh for the happy event, and I will be off-line for the next week or so. I'll be reading your blogs, and posting to mine again when we get back home. Thanks for your patience, understanding, and all the good wishes you have sent my way! I'll post some pictures as soon as I'm able! Husband is in shower. Wife is reading USA Today at the desk in an overpriced hotel room in downtown (here pronounced “don-ton”) Pittsburgh. Bathroom door opens. Hubbin emerges, wearing a towel wrapped around his waist, face covered in shaving cream, hair dripping wet. He returns to bathroom, razor in hand. So there I am, in my friendly local Joann Fabric store (no, it does not contain an ‘s’, nor an apostrophe, but thank you for asking, my fellow sticklers) waiting to have some fabric cut from the bolt. It’s a little like the deli, in that you have to take a number to assure that customers are served in the proper order. Also, it keeps all hell from breaking out. People can get a little crazy when someone is deemed to be cutting in line. Limbs may be lost. I’m just saying. Anyhoo, I’ve got my bolt of poly/silk for my son’s wedding canopy, and I’ve got my number. A couple of other assorted characters are clutching various bolts of fabric for reasons I can only speculate on. For instance, there’s a perfectly normal-looking twenty-something with three bolts of fleece with collegiate logos and teams on them. I can assume fairly safely that some couch throws are soon to be made. There’s a sweet couple: mother and teenage daughter with some pretty glitzy, shiny gold stuff that simply screams “PROM DRESS” at me. I’m sorry—did I just yell at you? Didn’t mean to. But then there’s this old man, and remember, I consider myself kind of old, so I’m talkin’ REALLY old here. No joke, the guy was at the very least 80, and could well have been 90. I am not exaggerating even a teensy bit. He was clinging to a notebook-sized plastic frame that held some sort of ‘braid-by-the-yard’. When it was his turn he asked the clerk for two yards of the stuff. She measured it out, and found that there was just a yard and a half on the frame. The old man (who was quite clearly by himself, by the way) shrugged and said that would be fine. Really? Fine? You need two yards, but a yard and a half will be fine? What the what are you buying this for? (Intellectual curiosity—I don’t really have any practical application for this knowledge.) He got the braid and toddled off toward the cash registers. Today the rain let up long enough for the Center of the Universe (CoTU) to put on his iPod and go out for a walk. I was still putting the finishing touches on my dress for the big wedding (youngest son—next Sunday—Pittsburgh! --be there, or be square!) so I stayed home. When he returned, he confessed that about ten minutes of the time he was gone was spent chatting with the neighbors, so he was careful not to accept thirty minutes of credit for an actual twenty minute walk. He’s a stickler for the truth, and his ethics are above reproach. This has no bearing on his ability to annoy the socks off of me, or anyone else for that matter. But, as they say, that’s not important right now. Meanwhile, I completed the hemming of the dress, the hemming of the lining (makes you want to read a Thomas Jefferson biography, doesn’t it—you know, the Sally Hemmings connection? ), some actual taking in of the whole thing (yay—beats having to let something out, doesn’t it? ), and the replacement of a fastener on the front doo-dad. Sorry for getting technical on you, but I call ‘em like I see ‘em. It’s a doo-dad; deal with it. So with my major and massive wedding responsibilities out of the way (later this week I’ll tell you about the wedding canopy I made them), I was liberated from my sewing room to make lunch for CoTU and me. While I was doing the prep work, CoTU was looking out the window (as he often does while I toil) and noticed several deer tromping across our back yard. This is pretty much a daily occurrence, but he commented on them anyway. And, anyway, I went to the window to look, because even though it IS a daily occurrence, I am a sucker for seeing these huge mammals moseying across the bluegrass, munching on honeysuckle and dogwood as they go. He pulled his eyebrows together, squinted slightly and cocked his head at me, fearful of what might be coming. 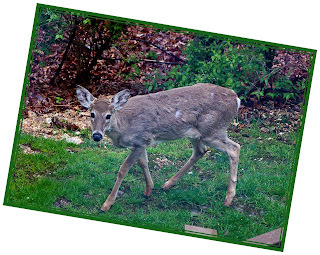 “Doe, A Deer, A Female Deer…” I intoned. His concerns were justified… Guilty as charged. 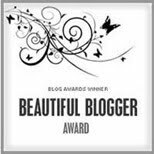 Here’s a travel-delayed, overdue message of sincere and profound thanks to two fabulous bloggers for awards they generously bestowed on me last week. First to the amazing Cleo at Wemmicks-in-Training, many thanks for the Honest Abe award! I’m flattered, really I am! I shall try to live up to your generous gift! (--while I try to stop overusing exclamation points [wait for it] ! 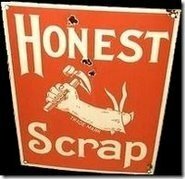 And secondly to my hero Anne-Marie over at Anne-Marie With a Dash, my endless gratitude for the Honest Scrap award! I’m truly delighted that you saw fit to honor me with this outstanding prize! So now, I ask myself, what’s the recurring theme here? Yes, Grasshoppers. It is the “Honest” modifier. I suppose this means I should stop making stuff up. Which is fine, because usually the real stuff is funnier than what I could come up with anyway. 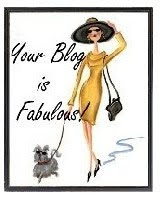 But go visit these wonderful blogs! You will not be disappointed, I assure you. Anyhoo, CoTU grabs the Tivo remote and puts the show on hold to say, (and this IS an exact quote), “See—my selfishness benefits both of us!” And, dear reader, I swear I am not making this up. “I know exactly what I want, and that’s good because it supports our relationship, so that must be good for both of us. In other words, if I’m happy, we’re both happy,” he stated with assurance. “But then we would both be happy, right?” he asked.